HarrodHorticultural: Harrod Horticultural in the Daily Express! Harrod Horticultural in the Daily Express! 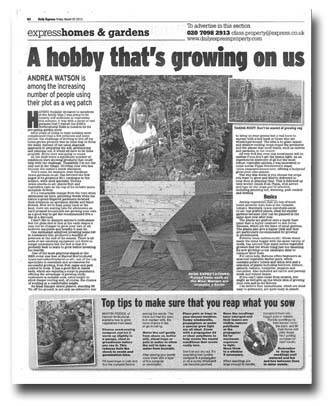 There's a real buzz about Harrod Horticultural today as page 62 of the Daily Express carries an article on growing your own vegetables - and our very own horticulturist Martin Fiddes has his vegetable seed sowing tips in print too! Not only has Martin's copy made it into the top line tabloid but it's his image which illustrates the main body of the piece by Andrea Watson, the Express's Property Editor! Martin's shot is of the Maxi Manger, a very popular multi-depth patio planter which provides you with the comfort of working at just below waist height (2ft 7in) and the the versatility to grow root crops and more shallow rooting salads in the same attractive planter! You can read Martin's seed sowing tips below - and don't forget to visit our Ask the Expert section where both Martin and pest control guru Julian Ives are on hand to solve your gardening queries! * Choose seed sowing compost and let it warm up in a garage, shed or greenhouse slightly before you use it – this reduces both the shock to seeds and germination time. * Fill your seed trays or pots and firm the compost before sowing the seeds – the more soil the seed is in contact with, the more chance it has of successfully germinating. * Water the soil gently from above or better still, stand your trays or pots in water to allow the soil to take up water from beneath. sunny windowsill, a propagator or under a special grow light. Cover with either a propagator lid or some clear polythene to help create the damp, warm and humid conditions seeds love. *Keep a close eye on the soil and don’t let it dry out. It’s surprising how quickly compost in a propagator or on a sunny windowsill can become parched. the propagator lid or polythene to give them maximum light. Move them to a window if necessary.